By William F.(Bill) McCready, CEO/Founder, Venture Planning Associates. Adapted. Informal venture capital provides 80% of all initial funding. Angels will provide equity plus loan guarantees. Angels usually invest with 2-3 others. Angels bring more than money to the table, often filling gaps in management skills. Angels usually do not want control. 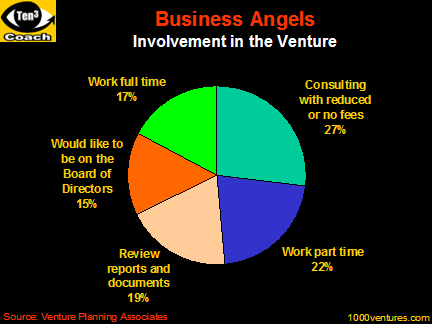 Angels request voting common stock or partnership interests. Angels are looking to exit their investment in 3 – 4 years. Will private investors want to be involved in your business? 21.7% will work part time in the business as employees. 27.0% will offer consulting help, sometimes with reduced or no fees. 15.1% will agree or ask to be on the Board of Directors. 19.0% will review reports and other documents. 17.3% will want to work full time for the business. While it may be possible to raise money from family and friends, it is not always the best idea. Often, the FFA funding source is less sophisticated than an experienced investor, and may have unrealistic expectations. If at all possible, use FFA funds as debt, or preferred, non-voting stock. This will help isolate this group and make it easier to raise capital for subsequent stages of development later from 'professional' investors. Private investors are as diverse as entrepreneurs. There is a wide range of profiles in terms of their industry expertise, business experience and, most importantly, their ability to work effectively with you. Successful angels make their investment decisions based on four fundamental criteria: management, market, products, and financial opportunity. They evaluate each criterion from the perspective of minimizing their risk and maximizing their return. Generally middle aged; 47+ looking for diversification. Have high incomes, but are not necessarily millionaires. Most are highly educated with advanced technical degrees, M.S. or Ph.D. They are very active investors averaging 3-4 deals per year. These individuals can be reached through numerous sources. They attend trade shows, venture capital type meetings, and visit universities to find deals. Finding them is a matter of personal networking. Many will remain hidden from the individual entrepreneur, so using an intermediary is often the only way to meet them. 'Gate Keepers', who screen projects for wealthy investors, and usually represent three to five individuals, a trust, family investment pool, or a group of medical professionals. Business Development Consultants who work specifically with startup, business development, mergers and acquisitions. Bankers, finance companies and savings or investment houses such as stock brokerages. CPA's, tax, accounting and bookkeeping companies. Attorneys, bankruptcy courts, and arbitration groups.